In this lesson we are going to look at how to play as the big stack when you are down to the final three players and faced with opponents that have short stacks. Having two short stacked opponents is the best possible situation. You can bully them mercilessly, especially until their stack gets below three big blinds. After that, it is wise to have some sort of hand before you put them all in. Starting hand requirements here include any pair, any ace, king-five or better (K5+), Q7+, J7+, T7+, and 98. If your hand is suited then you can further extend that range to include any ace, king, or queen, J4+, T6+, 96+, 86+, 76, and 65. That sounds like a lot of hands, but it’s only the top 50% of starting hands. 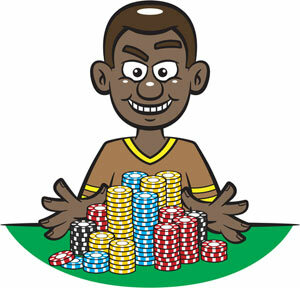 Since your opponents are going to be a lot more selective, you will find yourself winning the pot preflop a lot. If their stacks are less than a quarter of yours, you can be even more aggressive, since the risk to you is small. When one of the stacks in the big blind has less than two big blinds remaining after posting the blind, you should be aware that your bet will most likely be called all in by them (if they have half a brain). The pot will be expressing at least 3.25-1 to them (more if there are antes), and they should be calling with any two cards (they often don’t, but they should). On your end, you will be risking 3 big blinds to win 6.5 (if the big blind calls you). You are getting 2.17-1. Even if they only call you with top 10% hands, you still have the odds you need to put them all in. (Your two random cards are a 68-32 underdog against top 10% hands, and 2.17-1 are good enough odds to take that risk. Since there is a discrete, if small, chance that the big blind will fold, it makes raising even more +EV.) If you are just a little selective with your starting hands those odds of winning go way up. Note that the big blind also has positive expected value on a call with any two cards (chance of winning 50% * 2400 = +1200) – (chance of losing 50% * 1200) = net +600 EV for the opponent. This is because of the large amount of chips up for grabs in the form of the blinds. Although you are the one that put those chips out, you cannot factor them into your equity calculation as chips risked, since once they’re in the pot, they’re no longer yours, but they are available to be won. If your raising range is even a little bit tighter than just “any two cards,” the small stack must also have a little bit of a hand before calling. As the big stack, you should try to get a little bit of a read on the small stack opponent regarding how loose they will call your all in raise. As you can see from the chart above, the looser they call, the farther your EV drops if you are raising with any two cards. If you think the small stack is likely to only call with top 50% hands, you should be pushing any two cards. Any looser than that for the small stack, and you want to be slightly more selective with your raising hands (maybe top 80% of hands). There is one small benefit to very occasionally folding from the small blind as the big stack: if you see the same opponents all the time, they might begin to believe that you are just a little bit selective in that situation and respect your raises just a little bit more. On the button is a slightly different story for the big stack. Since any hand you play at this point will be all in, your positional advantage of being on the button is negated. The button is no longer the stealing seat when the blinds have small stacks (less that 3 times big blind). In fact, since your investment in the pot is zero (other than an ante), you have to risk more chips to take a shot at the pot. If the small stacks have 5 big blinds or more, you can raise a little looser from the button, since they will be less inclined to call. But if they have a very small stack, your raise increases their odds to call to an astronomical point.